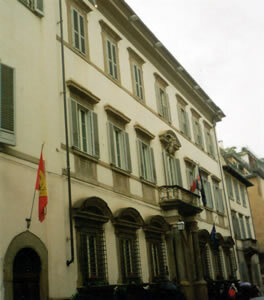 Number 87 via Ghibellina in Florence is the palazzo built in the 18th century for Jacometti Ciofi. As you can see in the photograph, its exterior has an appropriate nobility. The Relais Santa Croce occupies its upper floors, and is now part of the prestigious Baglioni hotel group. Emerging from the lift on the piano nobile, immediately you will be struck by the lightness and elegance of the architecture. The palace has been beautifully restored, clearly at enormous expense, and yet the atmosphere is comfortable and relaxing. One of the first people you are likely to meet is Roberto, at the front desk. Like his colleagues, he is a model of friendly and helpful enthusiasm. When I somehow managed to break the tortoiseshell frame of my elderly reading spectacles, he immediately set to work and, within minutes, had found me a convenient shop nearby where I could buy an economical temporary replacement. 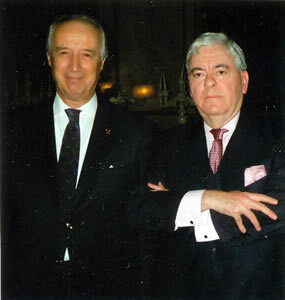 This, and many other examples of personal service, led me to conclude that the General Manager, Eugenio Rigo (pictured, with your correspondent) is doing a fine job. After the hall, you will probably step into the adjacent sitting room. I say ‘sitting room’, but this designation does no justice to what was the original music room of the palazzo. It is a chamber of remarkable splendour (pictured). If you like the white stucco of the 18th century – and I do – you will love this exquisite confection of plaster cherubs and musicians. It is worth seeing on its own merits – and that is saying quite a lot in this city of fabulous art and architecture. I could happily have stayed there for several hours. But my room was calling. The Relais Santa Croce has just 24 rooms, which helps to explain why the hotel has the atmosphere of a private house of the grander sort. 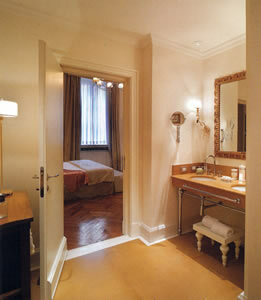 These include one of the largest suites in Florence, in which have stayed many of today’s stars of the musical world. My own suite, number 206, was more modest. (I must direct you to the hotel’s website for the prices for specific dates.) But it lacked nothing in restrained, modern elegance and had the all-important view: over the rooftops, to the marble facade of the mighty church of Santa Croce, soaring heavenwards. This was an apartment of light colours and discreet harmony, with floors of bleached wood, overhead spotlights and wall lights of crystal. In the proper hallway were a dressing room (with a private safe) and the entrance to the bathroom, with its very long tub, one wash basin, bidet and loo. The sitting room accommodated a substantial sofa in brown leather, a breakfast table with two chairs, a pretty little wooden cabinet and a television. Through double sliding doors was the bedroom, with a bed which had been made specially soft for me, two black leather armchairs, a good-sized writing table and a metal chandelier. On the walls, in sober frames, were Papal letters, heavy with wax seals, but I fear that neither my Latin nor my ability to read ancient hand-written text was up to the job of translation. The dining room of the hotel is the Ristorante Guelfi e Ghibellini, another of the impressive chambers next to the sitting room. I went down to dinner and sat at a table next to its white marble fireplace. It occurred to me that the sophisticated ambiance of the Relais Santa Croce depends very much upon the contrast between the classical building and its distinctly modern furnishings. Thus, above my head as I sat at the very cutting-edge table-setting was a truly wonderful trompe-l’oeil painted ceiling. I liked this constructive tension, just as I liked the good Italian glassware and the tiny bottles of olive oil, which were brought to my table by the waiter, Samuele. 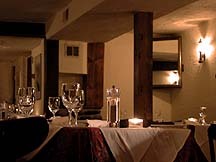 There is an intimate atmosphere in this restaurant, for its size is small. But the tables are of good size and they are well spaced. The chairs are rather low for me – but Samuele brought a higher one from the bar, to ensure my comfort. The service from him was, of course, proper and courteous. As the meal progressed, it became more and more apparent to me that Chef Fabrizio Innocenti is determined that his restaurant will be recognised as one of the best in Florence. And that is no small ambition, for the ground floor of this very building is occupied by the fabulous Enoteca Pinchiorri (see separate review), one of the world’s greatest gastronomic shrines. The wine list is short but well chosen. Its 72 bottles include our old favourites, Krug Grande Cuvée (450€), Planeta chardonnay (2009 - 70€) and Antinori’s Cervara della Sala (2008 - 95€). 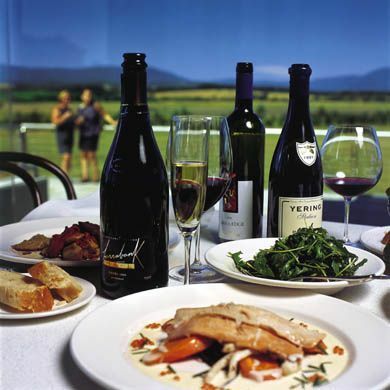 Prices run from 40€ for a blend of cabernet franc and merlot from the Trentino (Rungg, 2003) to 850€ for a magnum of 1999 Pommery Cuvée Louise champagne. I tried a bottle of Chianti Classico, whose heavy fruitiness went well with beef and its sauce (Castello di Cacchiano, 2008 - 60€). I returned to this lovely room each morning for breakfast (25€). From the extensive buffet I took dishes of melon, pineapple and fruit salad, plates of croissants and glasses of orange juice – all of good quality. And to my table were brought pots of coffee, dishes of ice cubes and the concluding cappuccini. I also asked for mushrooms on toast, which turned out to be splendid. 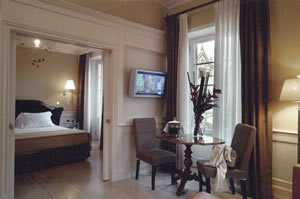 The Relais Santa Croce offers an elegant, sophisticated and comfortable alternative to the larger hotels of Florence. I commend it to you. Via Ghibellina 87, 50122 Florence, Italy.